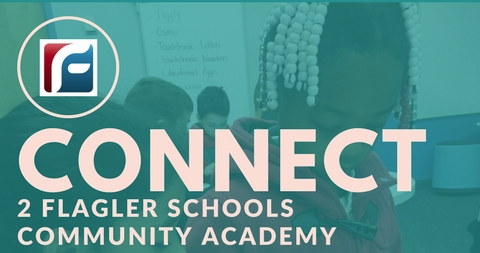 "Connect 2 Flagler Schools" Community Academy is an ideal opportunity to learn about the largest employer in Flagler County, and what it takes to educate over 13,000 students. The four 8:30a.m. - 11:30a.m. monthly sessions, will cover how your public schools create a pipeline of talent for Flagler County and how we're transforming education in and out of the traditional classroom setting. See first hand the quality and breadth of opportunities afforded our children in Flagler County Schools as we pursue our vision to become the Nation's premier learning organization. Session I: January 18th, 8:30 - 11:30a.m. Session II: February 15th, 8:30 - 11:30a.m. Session III: March 22nd, 8:30 - 11:30a.m. Session IV: April 19th, 8:30 - 11:30a.m.